Buteo Books co-published with Lynx Edicions Field Guide to the Birds of Machu Piccu and the Cusco Region, Peru by Barry Walker in 2015. Allen Hale worked with Barry Walker on this project and edited the text to accompany the illustrations derived from the monumental Handbook of the Birds of the World. Not having visited Peru since 2000, Allen was thrilled with the opportunity to join some friends for a trip to Cusco, the Sacred Valley, Abra Malaga, and Machu Picchu last month. Herewith follows his first hand account of the adventure. 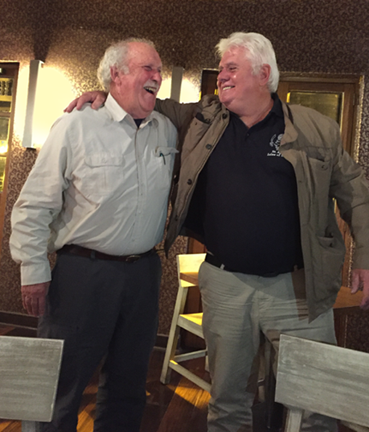 When my friends Larry and Betsy Pope announced they were planning a trip to Machu Picchu, I suggested we contact Barry Walker and have Manu Expeditions put together a proposal for us. An itinerary for a ten-day trip was prepared by Barry, et al, with nights in Cusco, Ollantaytambo, and Machu Picchu. We had the option of choosing a birding guide or a cultural guide and chose the latter since two of our party were not keen birders. COPA Airlines covers much of South America and we were able to fly to Lima from Dulles Airport via their hub in Panama. In one of the many vagaries of air travel these days, the RT fare to Lima cost less than a RT ticket to Panama. I chose the Gran Hotel Bolivar on Plaza San Martin in the city center, noted for Pisco Sours and the Model T in the lobby. The following day we flew over the Andes to Cusco, the navel of the universe, at an elevation of 11,300 feet where the thin air held us to a slow pace with many pauses to catch our breaths. In the city, the Rufous-collared Sparrow was everywhere and later found present in virtually every open habitat. The next morning we were met by Danny Vargas who took us to marvel at many of the Inca ruins in and around Cusco. Not only was he extremely knowledgeable about Peru's extraordinary past, but made stops here and there to see and hear birds. At one stop, we saw the Andean Goose, Duck, Teal, Coot, and Gull. And at other stops on the hills and ravines above Cusco: Rufous -fronted Canastero, Giant Hummingbird, Band-tailed Sierra-finch. After another night at the El Mercado, we were on our way to Pisac and the Sacred Valley. A Black-chested Buzzard-Eagle was seen soaring above the Puna grasslands. And in an area of burial caves, we saw the striking Bearded Moutaineer along with the familiar Southern House Wren. The terraces scaling the mountainside above Pisac are astounding; these and the related structures required extraordinary ingenuity and effort to build. After lunch at Urubamba, we learned a railroad work stoppage was scheduled for the following two days and would prevent us from taking the train to Machu Picchu as scheduled. So, we decided to switch our nights in Ollantaytambo with those in Machu Picchu Pueblo. Manu Expeditions office in Cusco went to work and managed to change all the necessary reservations. We boarded the last train headed to depart for Machu Picchu and were joined by about 400 police in full riot gear. Night had fallen and we had to make frequent stops to allow the trains loaded with tourists fleeing Machu Picchu due to the uncertainty of the strike. We were met by staff from the Inkaterra Machu Picchu Pueblo Hotel and led to our luxurious rooms. In my view, the grounds of the Pueblo Hotel with trails overlooking the river and winding through the gardens and forest are as great an attraction as the ruins of Machu Picchu. And, we had the place practically to ourselves as no new guests were able to arrive by rail. Nevertheless, we braved the crowds of peaceful but raucous protesters and passed through police lines to catch one of the few buses ascending the swithbacks to the World Heritage site of Machu Picchu. We spent the morning wandering the ruins, still often out of breath at 8300 feet. There were not the usual crowds. Most tourists seemed intent on taking 'selfies.' Birds are scarce; the Inca Wren was heard and American Kestrels were prowling the mountain top, probably as they have been doing since the 16th Century. The list of tanagers seen at the Machu Picchu Pueblo Hotel and along the road to Puente Ruinas would fill a long paragraph, a few of my favorites: the Beryl-spangled, Safron-crowned, and Silvery Tanagers. Other fabulous birds on the hotel grounds: Blue-naped Chlorophonia, Spectacled Redstart (Whitestart), Dusky-green Oropendola, Collared Inca (Gould's). After three days of protests (and the locals have legitimate grievances), the trains started running and (along with the 400 police) we headed up the river to Ollantaytambo. Here we stayed at the Hotel Pakaritampu with a lovely garden and views of the towering snow-capped Andean peaks. Hummingbirds and flowerpiercers frequented the flowering shrubs of the hotel garden and both Black-backed Grosbeaks and a Golden-billed Saltator were seen in the trees above the terraces. We had a full day to head north of the Sacred Valley to the high pass at Abra Malaga. Stops along the way produced Ash-breasted and Plumbeous Sierra-finches, Cream-winged and White-winged Cinclodes and fleeting views of Shining and White-tufted Sunbeams. As we drove into the clouds, we saw the Andean Lapwing and a migrating Hudsonian Godwit. In Polylepis stands, we were in endless pursuit of the Stripe-headed Antpitta, never catching a glimpse. But, after great effort climbing up a steep slope in the rain, a Puna Tapaculo appeared for an instant like a dark tennis ball. On a stop heading back to Ollantaytambo, we had a great look at a White-winged Diuca-Finch, which I learned when editing the field guide to the birds of Machu Picchu, nests at a higher elevation than any other passerine species in South America. On our return to Cusco, we visited Lakes Huaypo and Piuray where we found some familiar migrants: Spotted Sandpiper and Sanderling along with Collared Plovers. The Many-colored Rush-Tyrant is not to be missed. 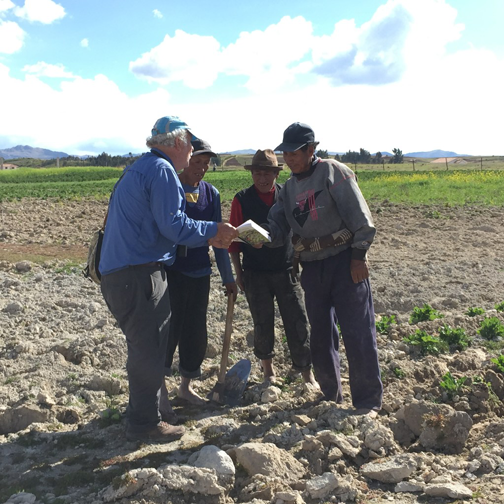 One of the highlights of the trip for me was an encounter with three Quechua farmers hoeing their potato patch on the shores of Lake Piuray. I asked them if they knew the Chu Chi Co (the Quechua name for the Chiguanco Thrush) and they said yes. I then pulled out the field guide and showed them the plate of the Many-colored Rush-Tyrant and they new the bird telling me the Quechua name. We caught up with Barry Walker our last night in Cusco and talked about birds, birding in South America, and bird books. While I admit to some bias, a Field Guide to the Birds of Machu Piccu and the Cusco Region, Peru proved its metal in the field and I was pleased to have played a part in its publication. Manu Expeditions is a veteran birding and wildlife tour operator and the office staff met every challenge with alacrity. Danny Vargas is an outstanding and versatile guide, not only knowledgable about birds, but able to discourse on archaelogy, history, anthropology, and Peruvian culture. I may organize a future trip to Peru with Manu Expeditions. Let me know if you might be interested. Read details of one of Allen's previous trips to Panama.